The second of four official direction changes we made on our circle around the U.S. technically took place on July 8th when we departed Maine. However, the left turn we made onto Interstate 76 just north of Pittsburgh felt more like a true shift in direction as we felt the vastness of the west laying before us. This would have been a bit daunting except we had decided to break up the initial westward drive with several stops in Midwest cities. The change in scenery was almost immediate as we entered eastern Ohio and became bounded by lush cornfields. In fact, cornfields were the dominate landscape across the entire Midwest and for the next 1,000 miles of our trip. This provided me with a new perspective on the corn industry…it’s freaking huge! 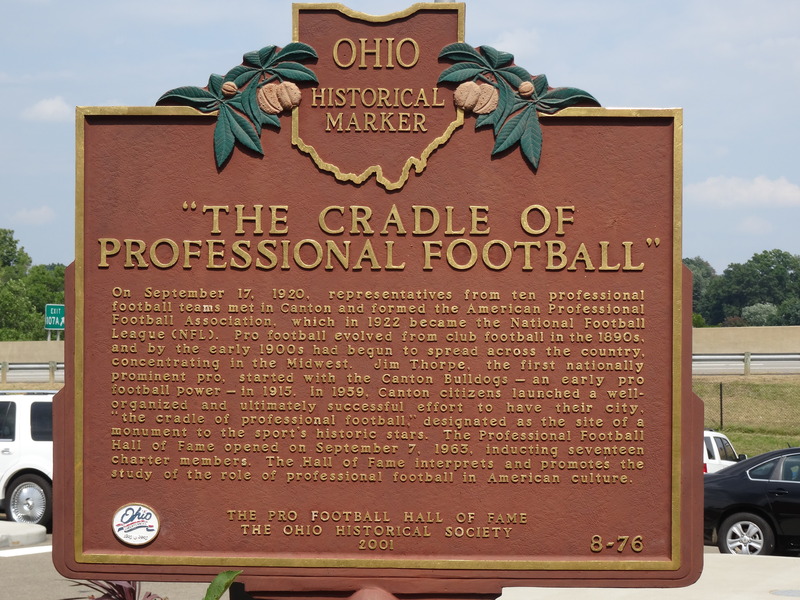 The Pro Football Hall of Fame is located in a Canton neighborhood bordering Interstate 77. 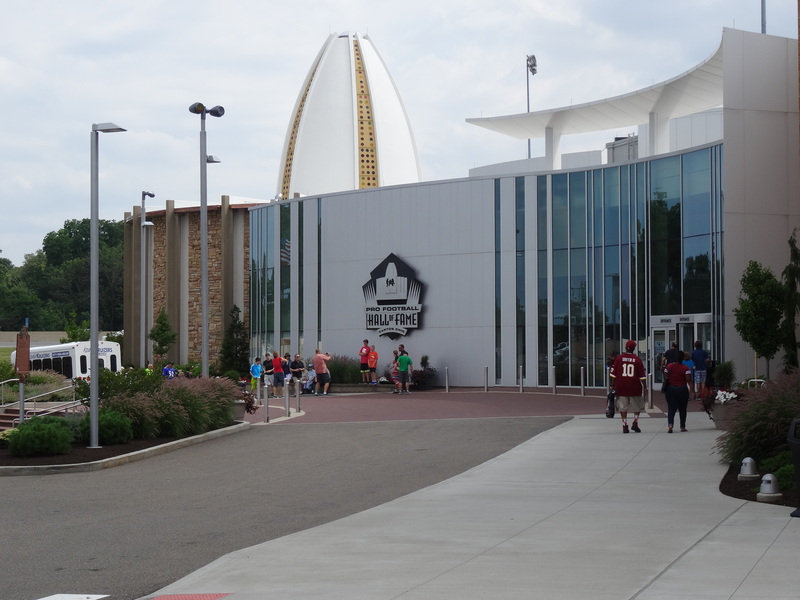 We paid $10 to park at an offsite lot and noted an energy and excitement in the air on the walk to the main entrance – a route that took us past a high school and its football stadium, which also hosts the annual NFL Pro Football Hall of Fame game, and past several homes. Once inside, we discovered that the excitement was in preparation for the festivities leading up to the 2014 induction ceremony that was to take place the following weekend. 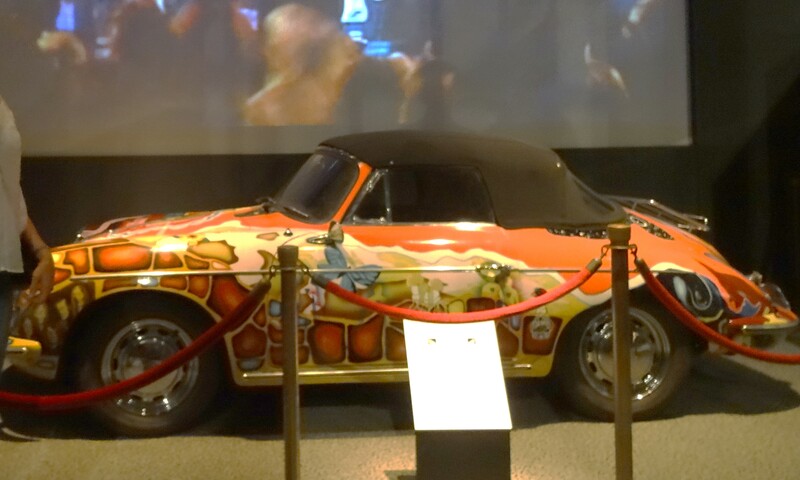 We were glad to find that our AAA membership allowed us to receive a discounted admission price of $20.70 each. Our late departure from Pittsburgh and the two hour drive left only a couple of hours to tour the Hall of Fame before it closed. We knew this would not be sufficient time, but decided to continue with the plan and take in what we could. 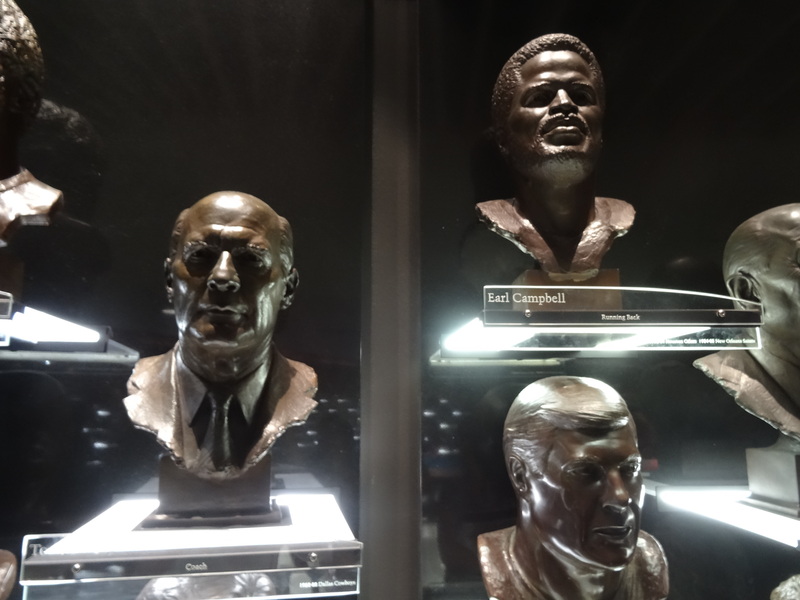 I enjoyed learning the history of football and seeing examples of its evolution through time, and Trey loved seeing the memorabilia and exhibits of his heroes! 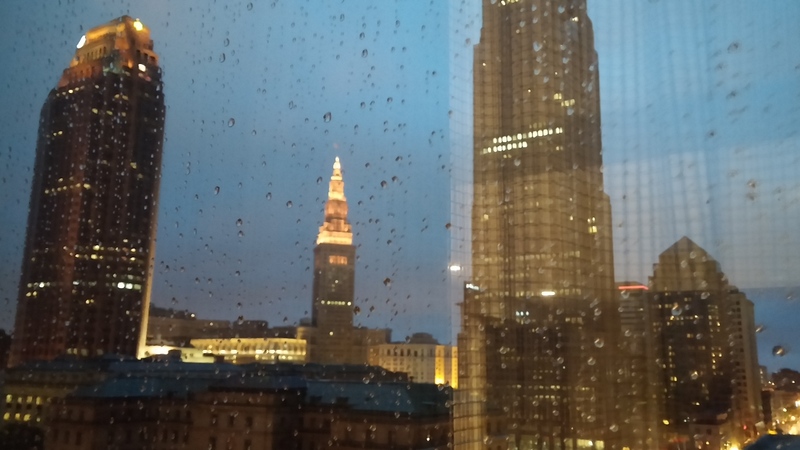 We rolled into Cleveland as the sun was setting and as it started to rain – a welcomed respite from what had been one of the warmer days to date. 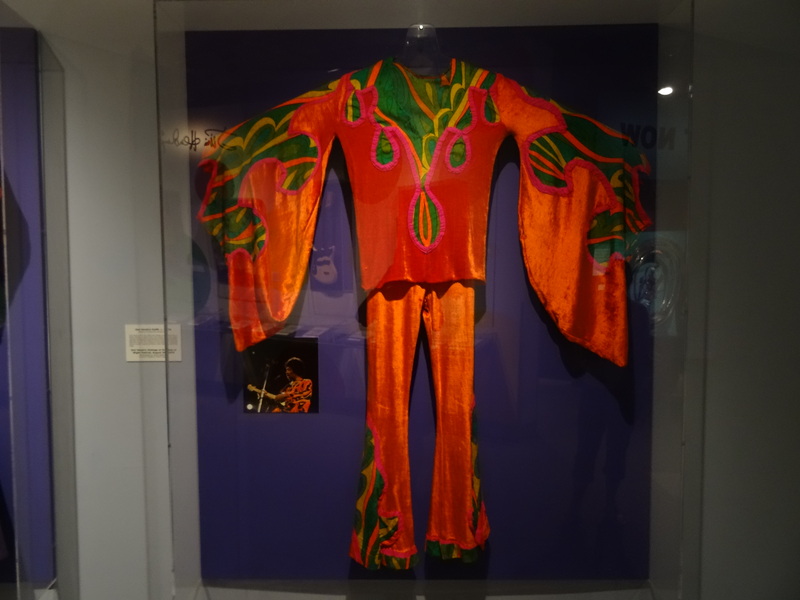 We used hotel points to stay at a Westin in downtown Cleveland and located a couple of blocks from the Rock and Roll Hall of Fame and Lake Erie’s shoreline. The fact that we were staying in a hotel was a treat in itself — a treat that was made even sweeter as we checked in and found out that it was a brand new luxury hotel and we had randomly been upgraded to a junior suite. Another gift from the Universe to be fully embraced and appreciated! 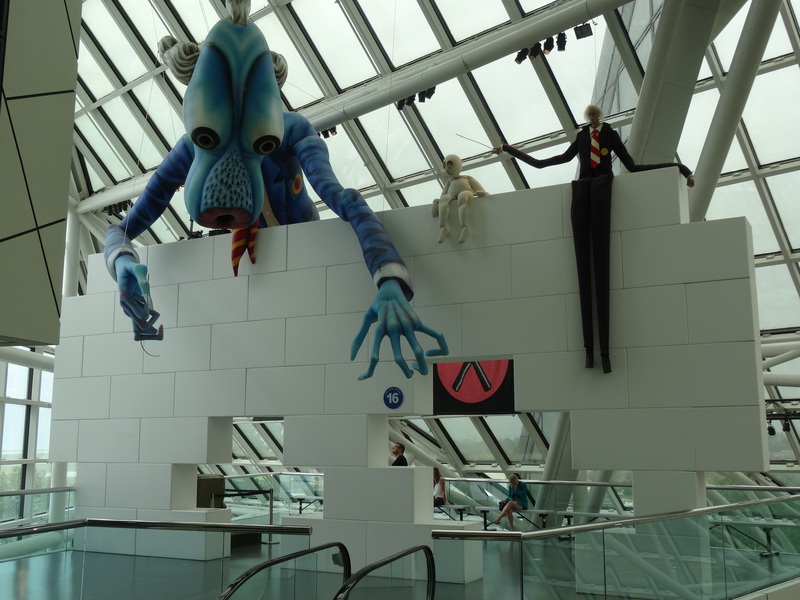 Cleveland quickly exceeded our expectations, or rather any expectations that we would have had if we had been there for anything other than touring the Rock and Roll Hall of Fame. As it was, we were pleasantly surprised to find a lovely city with a seemingly successful revitalization effort occurring downtown. There was a youthful presence on the streets, and fun vibes in and around the restaurants and bars located near our hotel. 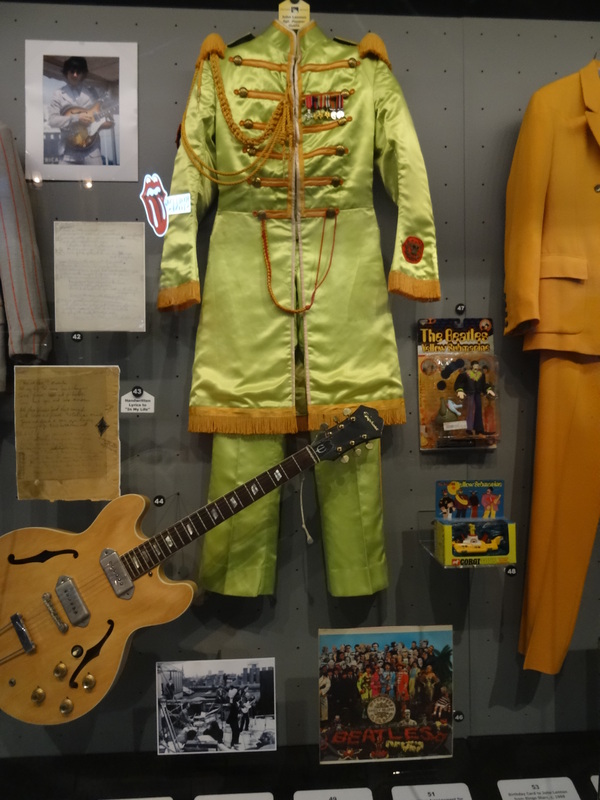 The number and quality of rock n’ roll artifacts were astonishing, making the $23.35 admission price seem very reasonable. 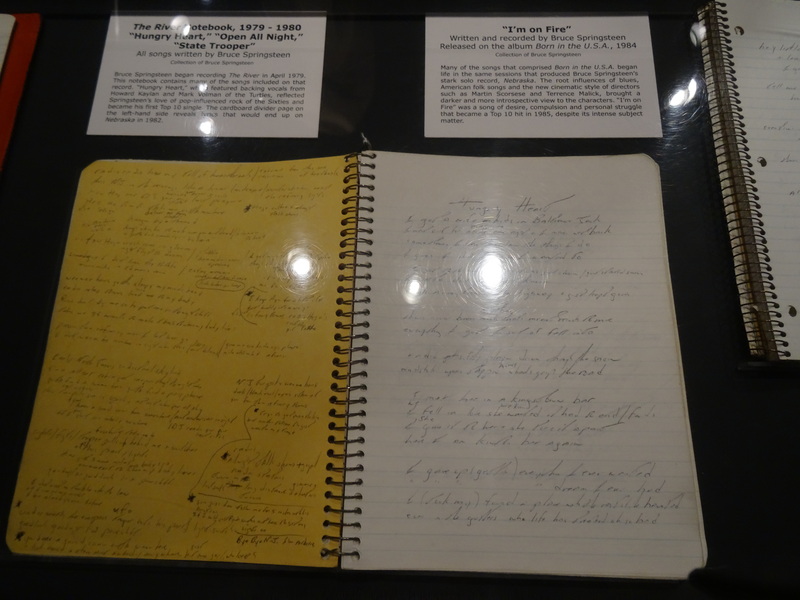 Highlights for me were Janis Joplin’s Porsche and Bruce Springsteen’s notebooks of handwritten lyrics, and Trey enjoyed the Pink Floyd tribute. We did have one critical observation: The story of Texas’ musical roots in blues and rock, and the artists that planted and sprang from those roots, is noticeably missing. Yes, there are exhibits of various Texas artists scattered throughout the exhibit halls, but not in an organized wholistic way that pieces together and reflects the big, authentic picture. 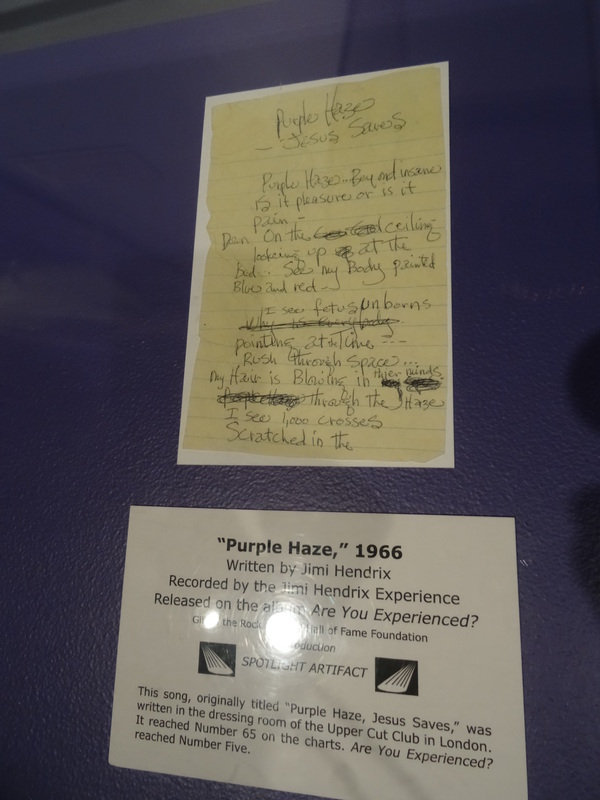 There are such exhibits for Detroit, San Francisco and Seattle and I am not denying that these cities’ musicians have made huge contributions. I just don’t understand how their influences on specific genres are recognized while Texas’ overall influence and undeniable contributions are completely ignored. I think we would still feel this way even if we could claim to be completely unbiased. 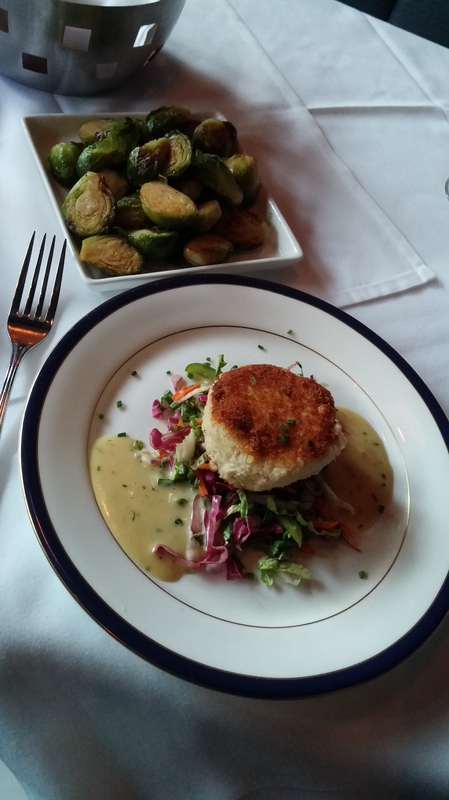 We also enjoyed brunch at The Nauti Mermaid, a nautical themed bar and restaurant, but forgot to take photos due to hunger. Love it! 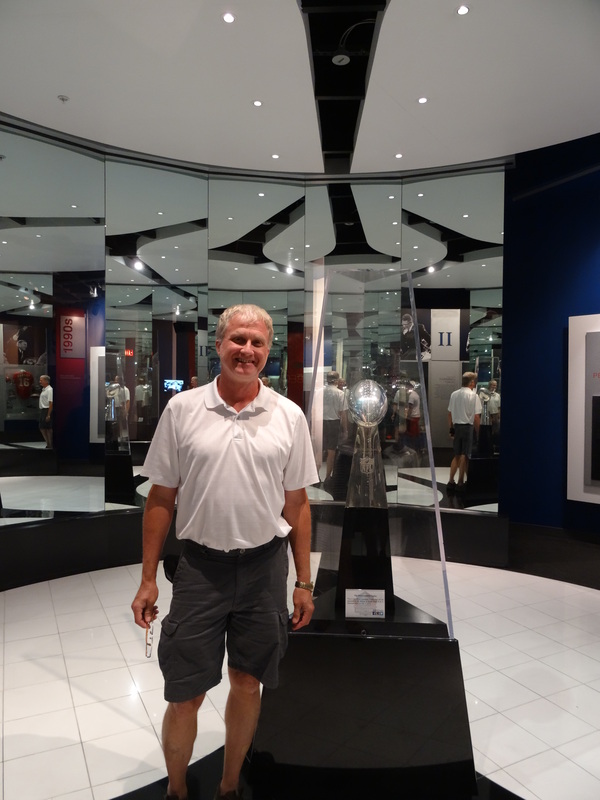 The Rock n Roll Hall of Fame, and the NFL Hall of Fame were great! One of many fantastic memories! Nice write-up!